Despite the number of turning points in “Erlkönig,” this episode belonged to Eddie Kessler: it begins and ends in his empty room, the poem from which Agent Knox quotes, the moment Eddie cracks and betrays Nucky at last, gives the episode its title, and the awful internal struggle Eddie undergoes in the meantime echoes, hollow, against the decisions made by people who wield real power and think far less about it. There’s a reason Eddie’s room has birds in cages; it’s no surprise that he jumped. But as it turns out, the reason Eddie is as painfully alone in the States as he is is because of a lapse in that loyalty: He left a department-store position with a pile of store money and a mistress from the makeup counter. Though it barely registers on the spectrum of ethically-questionable things we’ve seen, it’s the thin end of the wedge for him. Because of the shame this brought, Eddie’s younger son has changed his name, Knox reveals; the Kessler bloodline will die out. What’s the point of holding back? And while bloodlines are everywhere this episode, Eddie is uniquely helpless to do anything about his. And Eddie, invisible even to himself, doesn’t disagree. Alone and with nothing but his own exhausted internal resources, he recoils at the threats, real and imagined, behind the last lines of “Erlkönig,” a poem fittingly about family grief and the loss of a son, and gives the agents at last what they asked for (anything, it didn’t matter, the information meant nothing next to the giving in), sobbing that “it was what Nucky told me to do.” Knowing he’s broken, and too proud to explain to Nucky that he had, he instead plays the valet one last time and makes something troublesome vanish, having matched Nucky’s socks one last time, so Nucky needn’t worry. But the most haunting aspect of Eddie’s final arc is how sharply it throws into relief how little any character this week struggled with loyalty to anyone who isn’t bound by blood. (“Would he do the same for you?” Knox asks Eddie about Nucky’s loyalty, and we see that, heartbreakingly, Eddie already knows he wouldn’t.) Everywhere we look, we see the placement of people into the only two categories that matter: Family and Expendable. And this week, the one who got to call in that favor from Nucky was young William Thompson, who needs to sidestep a manslaughter charge for Henry’s death, and soon realizes he doesn’t care how it happens. After four seasons, those who surround Nucky tend to know how he operates and to be aware that for all his power, he has foibles. Nucky's conversation with Willy in this episode, explaining how he's going to make Henry's death vanish from Willy's life, is the first time in a while that we've seen Nucky the way people who need him see him: He’s straight-up bathed in a shaft of light. But by now, the camera knows we know better. He takes up only the first third of the frame, leaving the other two empty, in the half-shadowed way of most of Nucky’s secrets. “I need to know what’s true,” he says, “so we can agree on the rest of your story,” and because this is an episode about bloodlines, William is a Thompson, and he knows how to answer. Gillian, who has survived her life’s many atrocities by living by exactly that mantra, spends this episode focused on her grandson and on heroin, and she’s all out of heroin. “You reach a point in life, and you realize it’s what you leave behind that matters,” she explains to the judge in charge of her case, but though it’s right in keeping with the bone-breaking grip on family, her immediate offer of sexual favors doesn’t work in her favor, and trying to kidnap Tommy while high works even more poorly than that. Julia, who apparently lurks in the halls of the school waiting for Gillian to try something, appears with teachers in tow to prevent it. “This isn’t proper,” Gillian clips out, a chilling line from a woman who, having been stripped of everything else, is clinging with bloody fingernails to the adopted gentility that’s so far been both her social passport and her greatest weapon. Which leaves us with Van Alden, who spends this episode as nobody’s family. When he’s given control of the team of thugs at the factory, there’s an effortless glimpse of the Van Alden of old: In charge at last, he blossoms just for a moment into the leader he was. The problem is, he was a suspect leader the first time around, and the cocaine Al foisted on him doesn’t help his temper (he throws the first punch). His ability to anticipate the odds is undiminished, and when things descend into a melee, he’s the first to call things how they are. “We need those reinforcements or we need to leave,” he says, bravely interrupting two arguing Capones. But Al would rather beat dozens to death than ever admit defeat, and the fight is on. Van Alden’s time in Chicago has been occasionally illuminating, but Van Alden has been a man without purpose in his time there, dragged every way and hating it all. His scowl is a work of art, but aside from unfastening a case of irons at the right moment, he’s been a man waiting for a cause, and his only real electricity has been his antipathy towards Al. He finds a purpose here; watching Al Capone crawling through the riot, he anticipates the odds, and slowly, thoughtfully, raises his gun. The fallout from Eddie’s death is hard to extrapolate, which is interesting in itself given how other plots this week unfolded with the predetermined air of Greek tragedies. Will Nucky be distraught? Will he seek vengeance? Is this the moment Agent Knox makes his first real enemy? Or will Eddie, in a final slight, melt away from Nucky’s life next to things that Really Matter? 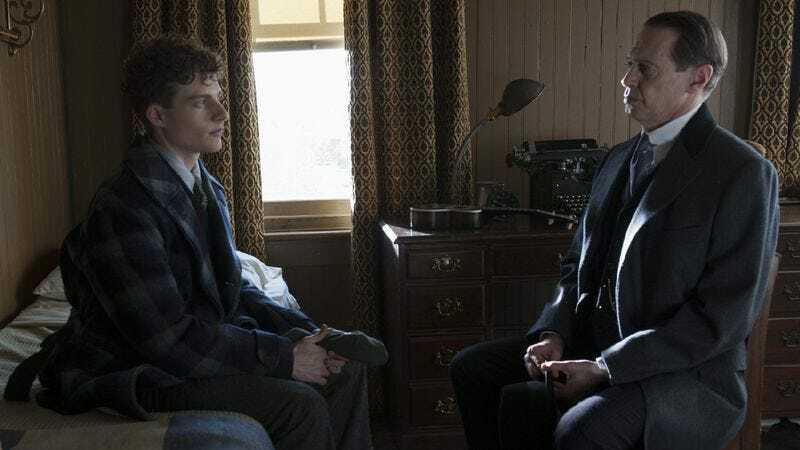 Light this week is a vicious thing: It blesses Nucky Thompson; Roy Phillips gets a mask of it across his eyes as he deems himself Gillian’s benefactor; Van Alden’s face is sliced in half by it as he accepts his mission from Capone; it intrudes on Eddie’s interrogation. It’s hard not to mark the similarity between Nucky’s “none of that matters” scene with Willy and the rightfully famous “It will shock you how much it never happened” scene between Don and Peggy in season two of Mad Men; mentor to apprentice, in a time of terrible strife. The biggest difference between them is that, for once, Don is being less selfish than someone else. 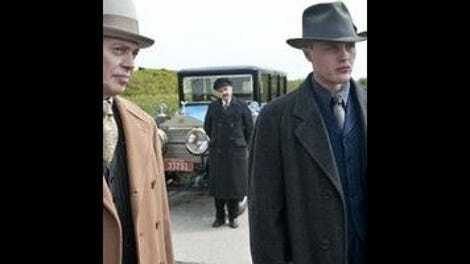 His advice to Peggy was to a large degree for Peggy’s benefit; when Nucky tells William, “The rage you feel, it’s a gift. Use it. But don’t let anyone see it,” he’s only describing himself. Also interesting: In an episode rife with family ties, Nucky talks a little about his youth; he mentions his first wife, Mabel, and the Commodore, both bloodless family ties he made for himself. Speaking of which: still no Margaret. No Richard, either, in this episode or the last one; maybe he’s walking back from Wisconsin. Most wrenching beat of the episode might be the ADA telling Nucky: “Someone’s got to answer for this. We just don’t have any choice.” Cut to Eddie.